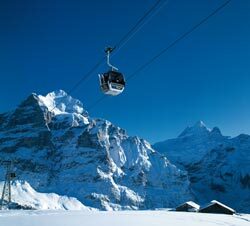 ABOVE: The Grindelwald-First gondola lift in winter. In Switzerland, engineers are seldom content to leave well enough alone. The Grindelwald-First lift, or Firstbahnen Grindelwald, is a case in point. This three-stage lift was once the longest chair lift in Europe, carrying passengers a distance of more than 5 kilometers or 3.25 miles. Hike to Grosse Scheidegg, a mountain pass on the shoulder of the Wetterhorn. There, you can dine and spend the night at the rustic but comfortable 19th Century mountain hotel before returning to Grindelwald or heading toward the Rosenlaui Glacier and Meiringen. Other attractions include the "First Flyer" (an 800-meter zip line with speeds up to 84 km/h or 52 mph), a "First Glider," a "First Bagjump" that requires a leap of faith, a "First Cliff Walk," an alpine playground for children, a guided downhill bicycling tour to Grindelwald, and more. The Grindelwald-First's summer schedule runs from early April until late October, with daily service from morning until late afternoon. In winter, the lift provides access to several dozen kilometers of alpine ski trails. You can ride to uppermost station and ski all the way down to the village center amid some of the loveliest scenery in the Bernese Oberland. Winter service begins when there's enough snow for skiing. The Grindelwald station is 10 minutes on foot from the railroad station, near the parking lot above the village center. All the facts about First, including fares and operating hours for the winter and summer seasons. Get information on lodging, summer and winter resort activities, and more from the Grindelwald tourist office.